As Cleveland Cavaliers coach Tyronn Lue motioned for LeBron James to step forward to accept the Eastern Conference Championship trophy, James didn’t budge, screaming “You got it!” As Lue, Kyrie Irving and Kevin Love each grabbed the mic to express their elation about reaching the NBA Finals, the man who returned to Ohio to bring his home region a title was content to stand in the background. As of Thursday that will no longer be possible as James steps into the heated spotlight leading the Cavaliers against the Golden State Warriors in Game 1 of the NBA Finals for the second year in a row. The Warriors are the favorites going into the Finals, and why not? They’re the defending NBA champions, have the two-time defending NBA MVP in Steph Curry, and showed unbelievable grit and resilience in coming back from a 3-1 deficit against Oklahoma City to reach the Finals. But, after last year’s Finals defeat, James continued to describe himself as “the best player in the world” and it’s a proclamation that’s still hard to argue — despite Curry’s heroics over the past two seasons. James has been in the Finals so much (six straight seasons and seven in his 13 years in the NBA), they could rename the event The NBA Finals featuring LeBron James. He’s a two-time NBA Finals MVP, a four-time regular season MVP, and a 12-time All-Star. ESPN ranks him No. 3 player of all time, and his ability to score at will, run an offense, control the boards and truly defend five positions might make him the most versatile player in NBA history. With a healthy Irving and Love this season, James has his best chance to bring the city of Cleveland its first professional sports championship since the Browns won the NFL title in 1964. In that event, Cleveland will explode. James likely becomes the true King of the North, and the team might not wait for his retirement to erect a statue outside of the Quicken Loans Arena in downtown Cleveland. And if the Cavs don’t win? That would put James at 2-5 in the NBA Finals. Sure, that’s a record that would still establish James with more rings than the combined group of Patrick Ewing, Charles Barkley, Allen Iverson, Karl Malone and John Stockton — some of the greatest players of all time. But in the eyes of many who salivate at any opportunity to pounce on James, a defeat in the Finals will further damage a legacy that is beyond repair. There are a lot of reasons to love James even if you aren’t from Cleveland. He’s the most talented player in the game. He loves his wife and kids, leading an off-the-court life that appears every bit that of the perfect family man. And he’s incredibly thoughtful, as he showed last December during a game in Boston when he hugged a teenage fan, Aaron Miller, who was being recognized by the Boston Celtics for his lifelong struggle with brain damage. After the game, James gave Miller his jersey. Those are some of the reasons that a 2015 Harris Poll listed James as America’s most popular male athlete for the second straight year. What’s the reason for the extreme polarity? Is it the arrogance of a player who considers himself the best in the world and wears T-shirts that read “LBJ MVP” and “Check My $tats” to flaunt his accomplishments and wealth? Is it folks concentrating on his Finals failures as opposed to his accomplishment leading teams that deep into the season? Yes, James has a 2-4 record in NBA Finals and some of those losses (such as the 2011 loss to the Dallas Mavericks) went down in damning fashion? But Los Angeles Lakers legend Jerry West only won one title in nine trips to the Finals, but the logo was bestowed upon him. Or maybe it’s the lingering feelings from The Decision, the made-for-TV event when James abandoned Cleveland to chase “not two, not three, not four, not five … ” championships in Miami. To gather some fan perspective on why James is so polarizing, The Undefeated gathered members of The Season Ticket (who hold a private Facebook sports forum) for an online discussion about America’s love/hate relationship with James. The initial question was simple: Why is LeBron James so polarizing? 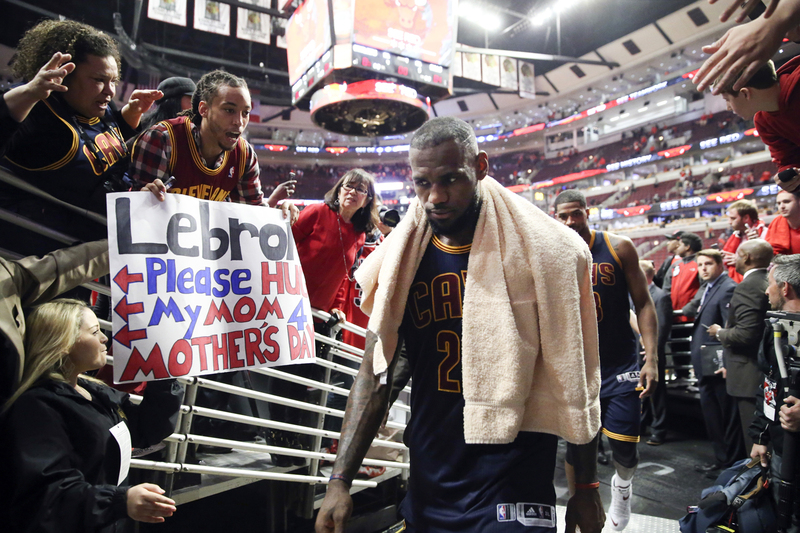 Cleveland Cavaliers forward LeBron James (23) walks off the floor after making his winning basket against the Chicago Bulls with no time remaining on the clock on Sunday, May 10, 2015, at the United Center in Chicago. Tai Allen, a basketball fan from Brooklyn, New York, joined Lowery in praising James: “How about we measure his accomplishments with the parameters of now? He wins. A lot. Yes, he has some wack character traits. He loses big games. He is polarizing because ‘we’ want him to be what ‘we’ want. Few just enjoy the show. And why is it that people take hate for James to extremes? In 2008 — long before The Decision — the website “Ihatelebronjames.com” was launched, spewing extreme disdain for James. On Twitter there’s a hashtag, #teampetty, started by a basketball fan in Miami, the place that James helped win two NBA titles. And there’s a Facebook group called “LeBron James Haters United” that, as of this week, has more than 47,000 likes. The co-owner of the “LeBron James Haters United” page wouldn’t give his name (he fears negative remarks from “hostile LeBron fans”), but was quick to provide reasons for his contempt of James. Like retired Los Angeles Laker Kobe Bryant (who ranked ninth on the most popular male athlete list, and fifth on the least favorite), James is well aware of his love/hate relationship with sports fans. If you were to read into this April 14 tweet posted three days before his social media accounts went dark for the playoffs, it would appear that, although aware of some of the contempt and resentment held for him, he really doesn’t care. There were just over three minutes left in the game Friday when Kyrie Irving was pulled to join the bench celebration. Approaching his teammates, he thought back a year before to the completely different emotions he felt during Cleveland’s 2015 clincher. This year Irving’s fully recovered from the fractured kneecap he received in Game 1 of the Finals against the Warriors last year, all but crushing Cleveland’s championship hopes. This year Love is completely healthy after dislocating his shoulder in the first round series against the Celtics, which forced him to miss the rest of the playoffs. This year the Cavaliers have a more seasoned Tristan Thompson, and a couple of key veterans who have helped increase depth. Richard Jefferson returns to the Finals 13 years after playing with the New Jersey Nets in 2003 (which, according to the Elias Sports Bureau, matches the longest span between Finals appearances in NBA history). And Channing Frye, who shot 58.3 percent from 3-point range against the Raptors in the Eastern Conference Finals, adds another perimeter shooter that keeps defenses from clogging the interior. This year, James has no excuses. The odds in Las Vegas opened yesterday favoring the Warriors, a prediction that was dismissed by James when he spoke to reporters at the Cavaliers practice facility on Tuesday. James knows this isn’t 2007, when he led a mediocre team (remember Drew Gooden and Boobie Gibson) to the Finals. The Cavs were swept by the San Antonio Spurs. James knows this isn’t last year, when an injury-plagued Cavs team lost in six games to the Warriors. James did go out in a blaze of glory, averaging 38.8 points, 13.3 rebounds and 8.8 assists. It was a performance that was MVP-worthy, but the guy who “slowed” James, Andre Iguodala, hoisted the trophy. Yet the expectations for James will always remain high and always beyond the expectations of any other player. It doesn’t concern James, who says his approach and outlook will always stay the same. Even as the criticism from the public remains divided.